Run, don't walk, to Chick-Fil-A. 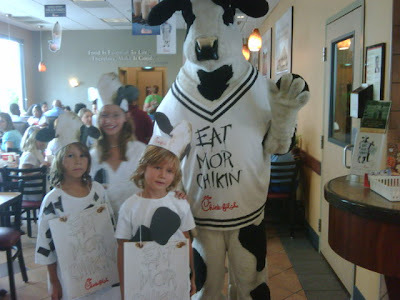 Oh wait, before you run make yourself some sort of cow costume ... that costume is worth a free meal. Today, Friday, July 10th is the day Chick-Fil-A celebrates Cow Appreciation Day. This is good today, today only. So get mooving. There are costume ideas, print-outs, and even a contest here. FYI- There really is such a thing as Cow Appreciation Day, which began before Chick-Fil-A began celebrating it. From what I hear it's either on July 14th or 15th. Really, you can google it, if you don't believe me. 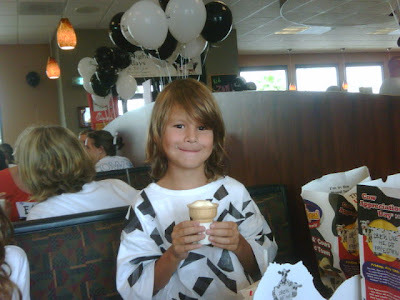 Another little tidbit we learned this week - if your child turns in their unopened toy at Chick-Fil-A they can get an ice cream instead. 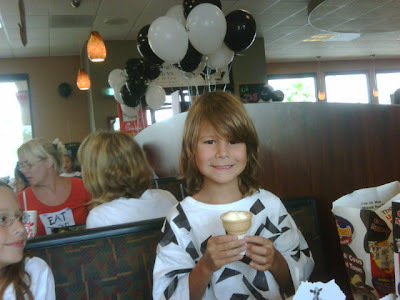 I love Chick-Fil-A. My kids enjoyed this much more than the top photo shows. Much more. They were ready to go at 9:15 this morning. I need a nap now.